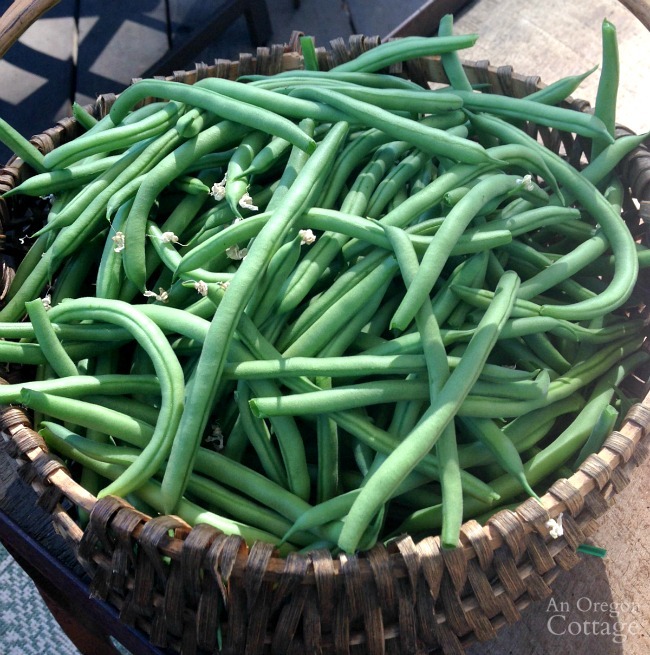 A one-stop-source for everything green bean: tips and varieties for growing, best practices for harvesting plus recipe links for lots of ways to cook (both fresh & frozen) and preserve for later- this is your ultimate green bean guide. This Ultimate Green Bean Guide is a part of this week’s Tuesdays In The Garden, with a theme of- you guessed it- garden guides! At the end of this guide, you’ll find links for how to grow garlic (regular and elephant), carrots, and peppers. Enjoy! 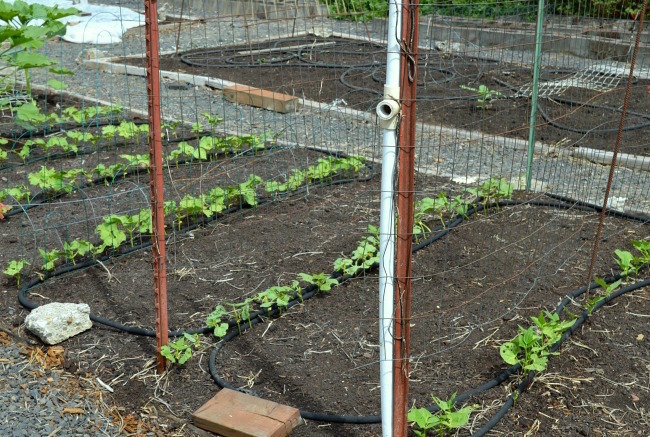 I think next to tomatoes, green beans may be the most-planted summer crop for home gardeners. It helps that they are SO easy to grow – basically stick the seeds and the ground and they will grow, if the birds, cats, slugs, or cutworms don’t get them first. But then they grow so fast, it’s easy to just plant more and still get a good harvest! Which means a good green bean guide is needed, to go along with our other popular growing guides, that can be your go-to article for green beans, not only why and how to grow and harvest them, but lots and lots of recipes! 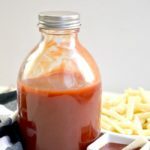 I love including AOC favorites and searching for the best other recipes for you – for cooking with both fresh and frozen beans and the best ways to preserve them (including our super popular non-blanched freezing method, of course!). Many people (especially older people) still refer to these beans as “string beans,” since older varieties often had a tough string that ran down the seam of the pod and needed to be removed. This trait has mostly been bred out of modern varieties, thank goodness (it’s why I didn’t like them as a kid!). Now they are usually called “snap” beans or just green beans. “Snap” refers to the fact that these beans are picked at an immature stage of dry beans (like navy, black, and pinto) making them so tender it’s easy to snap the ends off to prepare. I prefer calling them simply “green beans”, since that’s their color – and because I don’t usually snap the ends off, it’s a LOT faster to group them together and just cut the ends off all at once! What about “haricot vert” or “filet?” The first is just the French for “green bean” and the second is another French term that has come to describe, in the US, specific varieties that are thin and very tender. 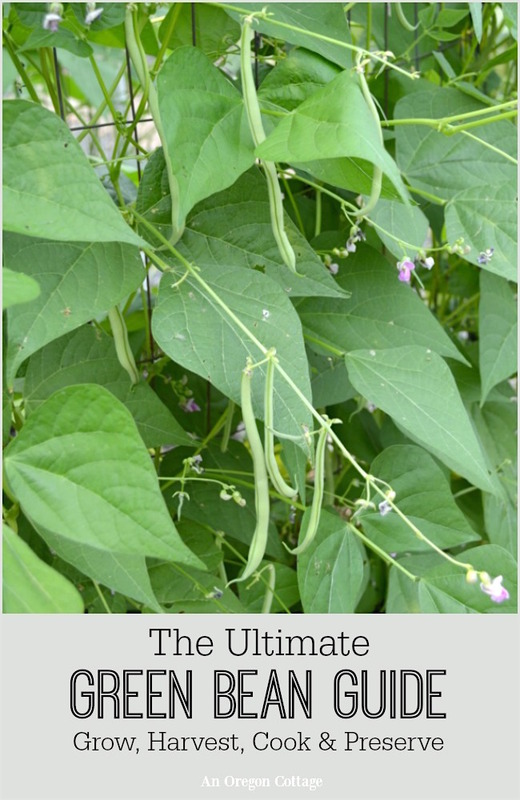 All beans add nitrogen to the soil, making them great plants for organic vegetable gardens. *there are a lot more, of course- these are the varieties that have produced prolific & tender beans for us. Pole Beans– they take longer to mature (10 to 11 weeks), but they produce about three times the yield of bush beans in the same garden space and keep on bearing until the first frost. 1. Emerite – my favorite bean of all, so I wrote a whole article about why they are awesome. 2. Fortex – I now plant a row of these along with Emerite, since they are SO long, providing lots of green bean for the space. 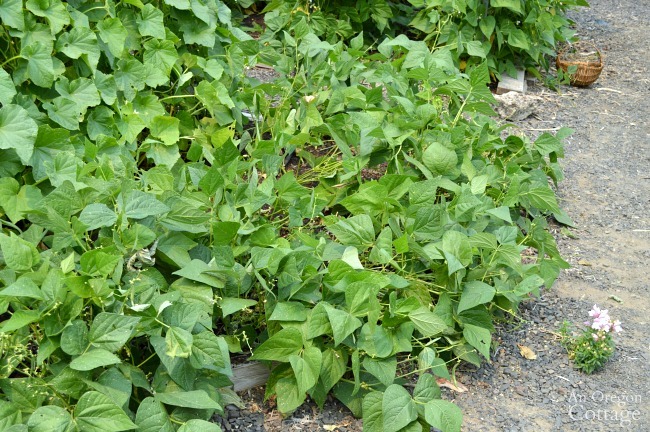 Bush Beans– they produce the bulk of their crop over a 2-week period so plant at 2-3 week intervals until about 2 months before the first frost for a season-long harvest. They are great for container gardening. 1. Jade – a bush filet bean that produces a lot (and for longer in my garden than other bush varieties) and stays tender. 2. Golden Wax – This is a great producer of yellow beans. 3. Amethyst – I don’t grow many purple bean plants, but usually plan for a couple since they’re so pretty (they turn green when cooked, though). This is a thinner purple variety, similar to the filet beans our family prefers. 4. Blue Lake – this seems to be the ‘standard’ that most grow and some prefer the taste of these. 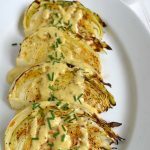 They are flatter and tougher than the filet beans I’ve listed, but are worth trying out to see what your family prefers (we grew them, but didn’t care for them). Flopping over mature bush green beans, making them harder to harvest than pole beans. All beans are sensitive to cold and grow best in air temperatures of 70° to 80°F, and soils at 55-60°F or above. Soggy, cold soil will cause the seeds to rot. Sow seeds outdoors only after last spring frost- they may not survive transplanting. Plant 1 inch deep, with bush beans 2 inches apart and pole beans 3 inches apart. Water regularly, preferably from the ground (soaker hoses or drip irrigation) – overhead watering encourages mildew and diseases. Beans only need a good compost covering as fertilizer – too much nitrogen fertilizer will produce lots of foliage but few beans. See our no-till, weed-free planting method for beans, corn and more here. 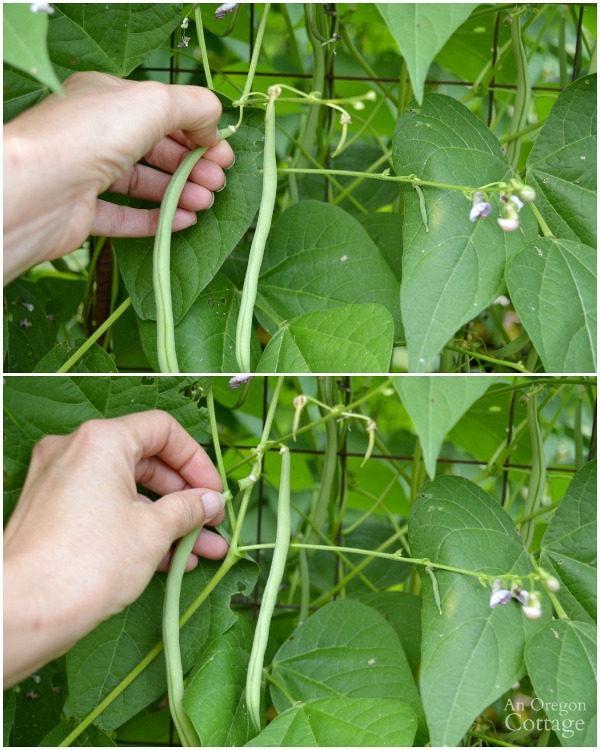 Look for firm pods 6-10 inches long and pinch off bush beans using your thumbnail and fingers, like shown above (or you can use scissors if you remember them). What you want to avoid is pulling on the plants, as that can pull them right out of the ground (um, yes, I learned that first-hand…). Harvest every 1-3 days to encourage continuous production – if the pods swell to fully ripe, the plants will stop producing and die, which is why you should pick and discard any overripe beans you missed from previous pickings. Be sure to harvest and cultivate beans when the foliage is dry or you may spread disease spores. To save seeds for the next year, stop picking in late fall and let the beans swell fully with seeds. Bring them inside to dry and then shell them, storing until the next season. Click the arrow for lots of recipe & preserving ideas + more garden guides!